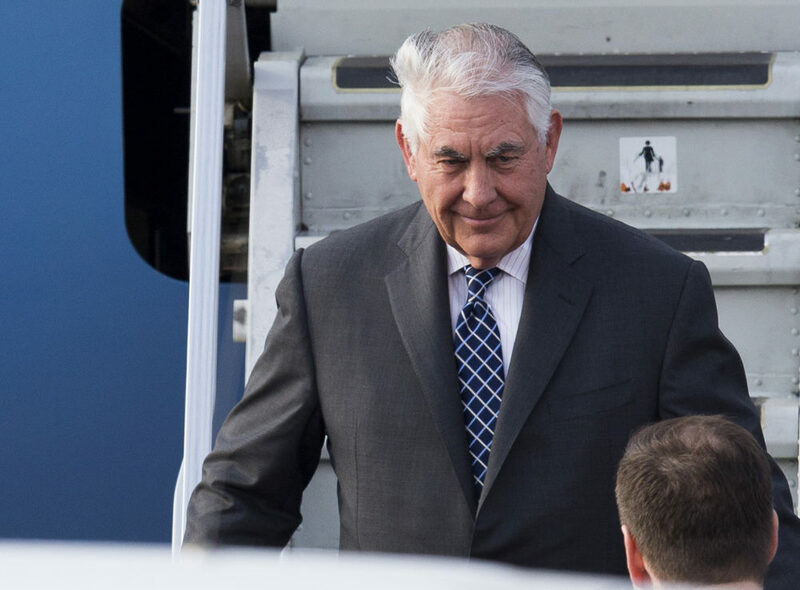 U.S. Secretary of State Rex Tillerson arrived in Moscow Tuesday with an ultimatum for Russia: Side with the U.S. and likeminded countries on Syria, or embrace Iran, militant group Hezbollah and embattled Syrian leader Bashar Assad. It wasn’t clear what the punishment would be for a Russian government that has used its military might to help Assad and his array of allies score a series of battlefield successes in their six-year war with Syrian opposition groups. Russian President Vladimir Putin immediately showed that he wouldn’t back down, saying Russia knew about planned “provocations” to blame Syria’s government for using chemical weapons. He said the U.N. should first investigate the attack. Tillerson is in Moscow to meet with Russian officials about the Syria civil war. It is the first official trip to Russia by a member of President Donald Trump’s Cabinet. It’s unclear if Putin and Tillerson will meet. His trip follows Monday’s claim by a senior U.S. official that Washington has concluded Russia knew in advance of Syria’s chemical weapons attack. The official, who wasn’t authorized to speak publicly on intelligence matters and demanded anonymity, didn’t offer concrete proof and others in the Trump administration cautioned that no final determination of Russia’s foreknowledge had been made. “We cannot let this happen again,” Tillerson said of the chemical attack. “We want to relieve the suffering of the Syrian people. Russia can be a part of that future and play an important role,” Tillerson added in remarks to reporters. “Or Russia can maintain its alliance” with Syria and Iran. The trade of accusations followed a long-set pattern for Syria’s civil war. Under President Barack Obama, the United States accused Russia of supporting Assad in war crimes against civilians and of employing a sophisticated disinformation campaign to protect its ally. 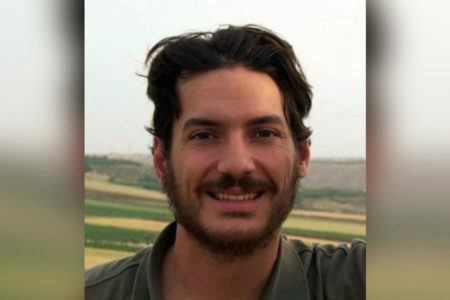 Assad and Russia have accused the U.S. of supporting terrorist groups, who’ve staged atrocities to gain international sympathy for their cause. There was one key difference: After the recent launch of 59 Tomahawk cruise missiles on a Syrian air base, President Donald Trump can now offer each a credible threat that the U.S. will use force in Syria if the stalemate persists. The Trump administration, however, has offered mixed messages about whether Assad must surrender power — and when. Tillerson said it was clear the U.S. saw no role for Assad in Syria’s future, given that he had lost legitimacy. Such clarity on Assad’s future isn’t shared by Russia, which insists that Syria’s leadership cannot be a matter for outside powers. Tillerson said Russian-sponsored cease-fire talks could generate momentum toward broader talks about a political transition — if they create a durable cease-fire. The idea is for political talks to follow, but Tillerson acknowledged the lack of progress so far. Tillerson spoke after a meeting of the “likeminded” countries was hastily arranged on the sidelines of the summit of the Group of Seven industrialized economies in Italy. A key focus since the chemical attack has been on increasing pressure on Russia, Assad’s strongest ally, which has used its own military to keep Assad in power. The U.S. and others have said that Russia bears responsibility for the deaths of civilians at the hands of Assad given Moscow’s role in guaranteeing the 2013 deal in which Assad was supposed to have given up his chemical weapons arsenal. That accusation will hang over Tillerson’s visit to Moscow, where he plans with meet with Russia’s foreign minister, Sergey Lavrov, and possibly with Russian President Vladimir Putin. The Kremlin declined to say if Putin would meet Tillerson. The United States has sought to minimize expectations for the trip or the likelihood that the U.S. will leave with any Russian concessions on Syria. Instead, the U.S. is hoping to use the visit — the first by a Trump Cabinet official to Russia — to convey expectations to Moscow and allow Russians time to respond. Though intended to punish Assad for a chemical weapons attack, the U.S. strikes last week also served to refocus the world’s attention on the bloody war in Syria. In Italy, diplomats spoke of possible new sanctions on Syria’s and Russia’s militaries, and additional U.S. military action if Assad’s forces continue attacking civilians.